Returning students and freshmen mingled and got to know each other at the Chabad Cafe on Thursday night before classes. Hundreds of students jammed the Chabad Center for the first Shabbat of the new semester. Munchies and mocktails gave way to candle lighting, a spirited Kabalat Shabbat and then dinner. Where there is love there is room was the operating principal. Binghamton University was the site of a Town Hall Meeting with President Obama on August 23, 2013. Rabbi Aaron Slonim, executive director of the Rohr Chabad Center for Jewish Student Life at Binghamton University and religious adviser to Jewish students at Binghamton, delivered the invocation welcoming the president to the university. A spread of bagels, shmears, pancakes and made to order omelets, coupled with fun ice breakers and tie dying Chabad T-shirts made for a delicious, fun filled welcome to Binghamton and Chabad "orientation." BBQ gets the year off to great start! As promised, the Chabad Welcome Back BBQ did indeed draw the coolest people to enjoy the best food and have the most food. About 400 students-- new and returning-- enjoyed the event under picture perfect skies. It promises to be a great year! Binghamton's annual Mitzvah Marathon-- cited this year in the USA Today report-- run since 2002, offered students and faculty at BU the opportunity to do a good deed to memorialize the victims of 9/11 and the Boston shooting. Hundreds flocked to the warm, explanatory services held by Chabad in C-4 this year. After inspirational holiday the crowd, joined by Hillel, enjoyed a bagel break fast. Apple picking in Binghamton in the Fall with Chabad- what can be a more fun and delicious annual tradition. Especially when turned into kugel an cobbler and cake, oh my! It's the Greeks at Chabad for the annual BBQ so old friends can meet, new friendships can be forged and Jewish Greeks can get more Jewishly involved. Students and Community members alike enjoyed making Challah, learning about the special Mitzvah and being part of a "web of love" as they made one challah for themselves and one for families in this community who will be the grateful recipients. 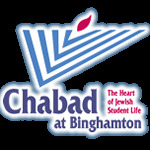 New to Binghamton students enjoyed exploring their newly adopted home town which offered some history with native, Charles Gilinsky, a game of Bowling a visit to Wegman's and great kosher pizza. Binghamton became a bit more homey as new friendships were forged on this trip. Good old fashioned competition and male bonding made the evening 3x3 basketball a big success! Self Defense and Sushi making were two skills the girls picked up at the GNO celebrating the month of Cheshvan. Members of CIW gathered to enjoy a musical Havdallah on their turf. Highlighting the 18th memorial event honoring the lives of Pauline and Philip Piaker, was Ethan Bortnick, a 12 year old child prodigy who is an accomplished singer, musician and composer. Bortnick wowed the audience with a musical combination of classic, contemporary and original compositions. He further endeared himself by taking questions from the audience and responding extemporaneously with honesty, humor and wit. It was a memorable night indeed! Hundreds and hundreds and hundreds of meals were enjoyed over the Sukkot holiday in the Chabad Mega Sukkah ( that is not quite big enough!). Students worked hard helping to prepare meals, set up tables, paint beautiful murals on the Sukkah walls and decorate to create the perfect ambiance and all the hard work paid off! On Thursday, Oct. 24 Binghamton University Jewish women got the opportunity to showcase their talents at the Chabad hosted Open-Mic Talent Show. Acts included recital of original poetry and prose, vocals, instrumentals, comedy and various forms of dance. An exhibit of original art, photography added further dimension to the evening.The Harpur Harpeggios and the girls of Kaskeset also preformed. Women's League Event "Beauty and the Beast"
This year's Salute to Jewish Womanhood program tendered by the Woman's League for Chabad featured an interactive workshop titled Beauty and the Beast: Body Image, the Media and the Power of Women with world renowned scholar, Shimona Tzukernick. Community women enjoyed a festive brunch and dessert buffet, each other's company and a "thought provoking and emotionally stirring session." There was an announcement made about a Spring trip that would take participants to the Crown Heights Section of Brooklyn, Lubavitch Headquarters for an insider's tour of the neighborhood.The date and details of the trip will be forthcoming. A Challah Baking session with Hadasa at the SDT house was one of the inaugural JEGABU - Jewish Greeks At BU - events. So much more coming! A Sunday morning Bagel, Lox and Tefillin gathering at the SAE house was one of the inaugural JEGABU - Jewish Greeks At BU - events. Assisted by Rabbi Levi, many of the brothers put on Tefillin, and for four of them it was actually their first time (a sort of Bar MItzvah)! Keep your eyes peeled for more JEGABU events!